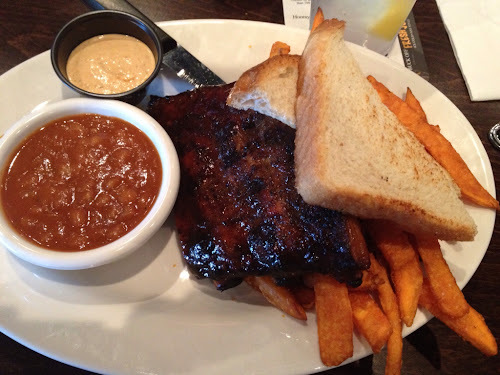 Queen City Q recently opened in Uptown Charlotte, and there was much rejoicing. At least from me. Anyone who is familiar with Charlotte knows they have been lacking in places for good BBQ. Being located at the center of both Carolina's you would think there are many BBQ joints serving the classic Carolina slow smoked pork. You would be mistaken. There are a few BBQ places but finding one where you want to pay for the q is difficult. Yes the Queen city has been lacking in the "Q" department but that is changing. Myself and fellow BBQ bloggers Wanye, of Big Wayners BBQ Blog, and Wilfred, of Oshawa Ogre's Blog, met at the Queen City Q for lunch to try what they had to offer. The decor of the restaurant fits well. It has an upscale feel that fits Charlotte but also a rustic atmosphere that goes with the BBQ. They have a bunch of big screen TVs scattered around the restaurant and two full service bars. 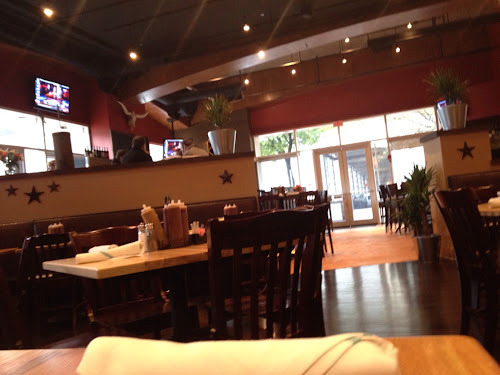 It would be a great place to hang out and watch a game or grab a bite before a Bobcats game or other event at TimeWarner Arena. The wait staff is friendly and helpful. You can ask them questions about the food and they will answer, if they don't know the answer they will find it for you. 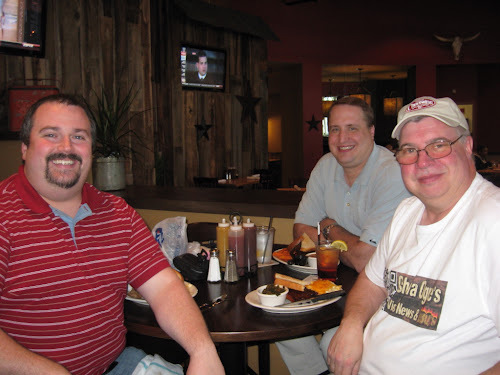 We were lucky enough to get to talk to Boon the pitmaster and Bryan who is one of the owners. Boon grew up cooking BBQ and many of the recipes are from his family. His love for BBQ shows in his food. I was fortunate enough to be able to try the pulled pork, ribs and brisket. All three are great. The portion sizes are large and will fill you up. I tried some of the pulled pork and was happy to see that it came with out sauce and with the bark mixed in. The pork has a nice kiss of smoke flavor in it and the bark brings extra flavor from the rub that is put on it before it is smoked. 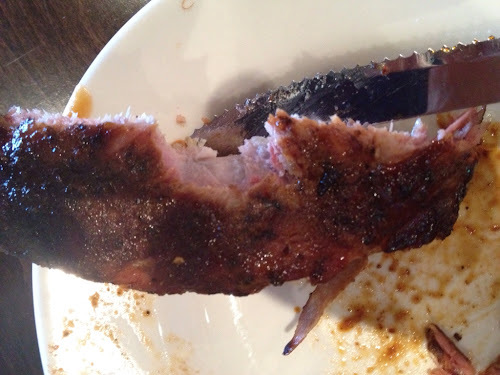 The ribs are a wet rib not a Memphis style dry. They rock. The sauce they use on the ribs has a bit of spice and sweet that carmalizes during the cook and enhances the flavor of the pork. The meat is cooked perfectly so you get that beautiful watermelon bite mark. Brisket is one of the tougher meats to cook but Queen City Q nailed it. They let us try two styles of thier brisket. Since they are just opening they are trying to figure out which style to go with on the menu. I hope they have both. The first style is a sliced piece of brisket with a little sauce on it. The second is a slice of brisket that has been brushed with the sauce and put back on the grill to let the sugars in the sauce carmalize. Both are great. The brisket shines in both styles and the sauce is just an enhancer to bring out the flavors of a well smoked piece of beef. It is tender and juicy the way brisket should be. To Sauce or not to Sauce? I like sauce but I like BBQ that doesn't need sauce. Queen City Q's bbq doesn't need it but the sauces they use are compliments to the meat. They have four sauces. A traditional mustard sauce, a vinegar sauce, the Popo sauce and one that mixes all three. Each of the sauces is really good. The mustard sauce isn't so mustardy so that is all you taste. The vinegar sauce brings a nice twang and some heat to the mix. The Popo sauce is named after the pitmasters grandfather as it is a sauce he made. It is also used to glaze the ribs and has a nice sweet spicy flavor. The fourth sauce sounds like it shouldn't work but it does. the flavors marry for a symphony of flavor. They have a large selections of sides. From fries to collard greens and a couple inbetween. 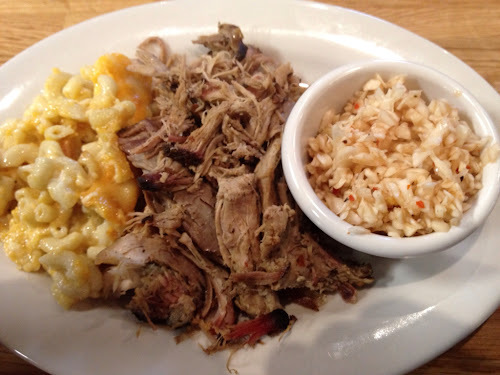 I tried the classic BBQ sides; mac and cheese, beans and NC style BBQ slaw. The mac and cheese was my favorite. They make it right. They bake it. It is creamy and cheesy and just good comfort food. The beans have a good sweet savory flavor with a touch of spice that you would expect form good baked beans. I'm not a huge slaw fan but do like a good vinegar slaw and their slaw is that. Good. The flavors marry together for a twangy sweetness that complements the BBQ. Just beware, when you get near the bottom of the slaw bowl the heat and twang may intensify as the dressing settles there. They have a selection of desserts also. Banana pudding, of course, bread pudding, brownie and icecream. 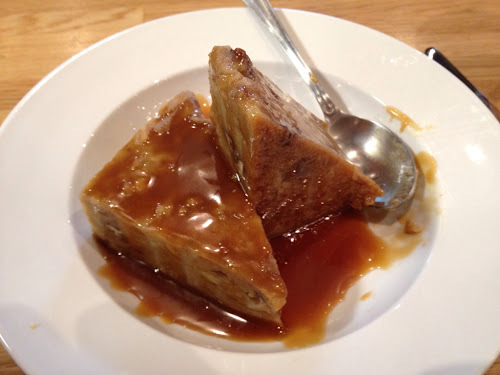 I tried the bread pudding. It is dense and rich with a carmel bourbon sauce to top it off. It is big enough to share. 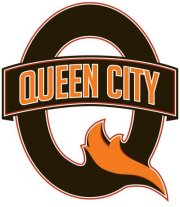 Queen City Q is putting the "Q" back in the Queen City. It is good. If your in Charlotte and looking for a place for good BBQ try here. If you live in Charlotte or are uptown for anything and need some Q, this is the place to go. The atmosphere is great, the servers friendly and the postmaster knows his Q. On the Gibbs Ribs* Scale I give Queen City Q a solid full rack of ribs with a side of mac and cheese. Queen City Q does BBQ right, they let the meat shine and the sauce enhance. How much do you get paid to do a review? I wish I got paid to do reviews. Most of the products and restaurants I review are paid for by me and I just really like them. I have been given some products to review or someone else has paid for the meal but usually it is out of my pocket. Why do you ask?